When you think of American and Soviet Cold War nuclear arsenals, the descriptor ‘huge’ automatically comes to mind. 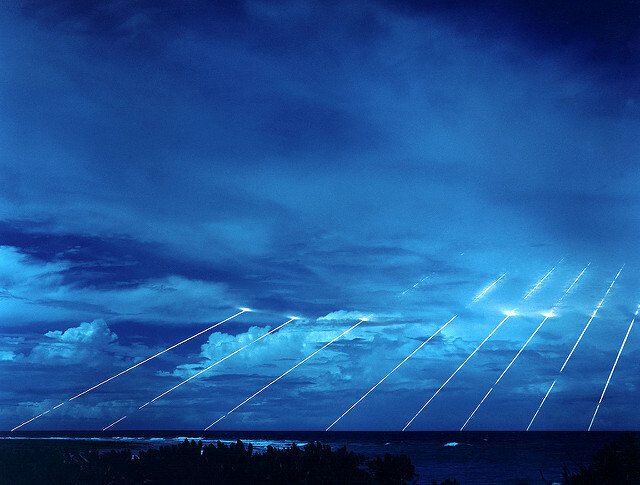 One technological innovation in the 1970s contributed more than any other factor to the creation of those five-digit warhead stockpiles : multiple independently-targetable re-entry vehicles (or MIRVs). MIRVs allowed a single ICBM to carry multiple warheads and hit multiple targets, so warhead numbers grew rapidly as more missiles were MIRVed. Despite many believing that MIRVs would be reduced to Cold-War-relic status after the collapse of the Soviet Union, they’re beginning to make a comeback in Asia. It’s a development that has worrying implications for the Asian nuclear offence–defence balance. A recent book from the Stimson Center , The Lures and Pitfalls of MIRVs: From the First to the Second Nuclear Age  (PDF), provides an excellent overview of that topic and is worthy of an in-depth read. For the sake of brevity however, I’ll summarise the main argument. While the development of MIRVs led to rapid expansions in US and Soviet nuclear arsenals and the embrace of counterforce targeting, the big nuclear powers in Asia (China, India, and Pakistan) are MIRVing much more slowly. China has had the technical capacity to MIRV since the 1990s, but has only recently done so on a limited number of its ICBMs , primarily in response to US missile defence systems and to demonstrate China’s technical skills. India, the authors argue, has gradually shifted towards MIRVing its own missile force due to China’s nuclear advances, as well as domestic pressures. Meanwhile, they argue that Pakistan’s pursuit of MIRVs will in turn be driven by its rivalry with India. The authors conclude that while the slow pace means that MIRV-induced competition in Asia is likely to be less intense and less destabilising than US–Soviet competition in the Cold War, the triangular nature of the competition opens up more avenues for external disruption and unintended consequences. An interesting takeaway from the book is that one of the commonly-held public justifications for MIRVs doesn’t really pass muster. Chinese proponents of the technology often cite the need to penetrate improving US ballistic missile defence (BMD) systems as a justification for introducing multiple warheads to their missiles. BMD has long been controversial  among nuclear strategists, as its (theoretically) successful implementation removes the opponent’s ability to guarantee retaliation against your homeland if attacked, which undermines deterrence and encourages striking first. The issue here is that this misunderstands the capabilities of current ballistic missile defence systems. As Andrew Davies and Rod Lyon  point out, current missile defence systems work best against attacks featuring a small number of short-ranged ballistic missiles that are simple in nature (i.e. missiles that don’t employ countermeasures). MIRVed ICBMs are the exact opposite: they’re long-ranged, typically equipped with sophisticated countermeasures (such as dummy warheads or chaff), and, in theory, would be launched in large numbers. Destroying ICBMs in their boost phase  is the ideal way to counter MIRVs, but the technology to guarantee interception doesn’t currently exist and requires persistent capabilities that are politically risky . But it becomes more difficult and costly to intercept an ICBM as it gets further along in its flight trajectory. Most current BMD systems (such as Patriot  and THAAD ) intercept ballistic missiles in their midcourse or terminal phases using interceptor missiles. But once the warheads have separated from the booster—which occurs in the midcourse phase—those types of BMD systems would have to destroy each individual warhead with an interceptor missile to work effectively. Given the cost  of a single interceptor missile, fielding even a moderately effective defence against an incoming ICBM strike is likely to prove too expensive to be practical—even if the ‘leakage’ of multiple nuclear warheads could be judged acceptable. MIRVs help to skew the offence­–defence nuclear balance firmly towards the offence even as BMD capabilities improve. Putting multiple, individually-targetable warheads on a large number of missiles also provides a substantial first strike capability, as it allows you to potentially disarm your opponent. That, in turn, encourages a first strike, creating a ‘use it or lose it’ mentality that decreases stability. This problem is especially acute for stationary silo-based missiles, which are vulnerable to attack. Deploying MIRVed missiles at sea makes more sense, because submarines are generally more survivable than silos—a reason why the vast majority of the US’ nuclear arsenal is deployed underwater . China ’s developing MIRVed SLBMs alongside its ground-based arsenals, which suggests Beijing wants to keep a foot in both camps—at least until it’s more confident of its SSBN/SLBM capabilities. India’s sea-based deterrent is also in its infancy, so it’ll be relying on its vulnerable siloed ICBMs for deterrence for the time being. However, the slow pace of MIRVing in Asia today is a hopeful sign that the region’s nuclear-armed states have learned from the Americans and Soviets about the consequences of unchecked MIRVing. But the fact remains that MIRVs, and the potential for instability that comes with them, will be an important part of the Asian nuclear balance for decades to come. Christopher Cowan is a research intern at ASPI. Image courtesy of Flickr user Charlie NZ.